These past couple weeks have been a blur. So much has happened this whole experience feels like a whirlwind. Not long ago I was stepping off a ship from my homeland of Germany with nothing more than $150, my family and a small bag of personal belongings. I didn't spend long near the loading dock where I disembarked the ship. I gathered my wagon and other objects needed for the trip and set off on my journey across the Oregon Trail. The first couple days on the Oregon Trail flew by. I was entertained by the constantly changing surroundings. The children loved the excitement of seeing the countryside. But soon boredom stepped in. By day 5, I could barely take the monotony of our everyday ride across the trail. My wife and I would just spend the days riding in the wagons and contemplating past events of our lives. 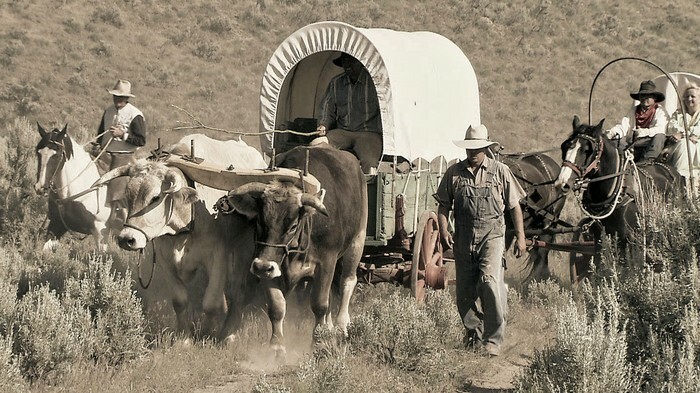 Wagons on the Oregon Trail. Digital image. WHY "THE OREGON TRAIL" IS HORRIBLE,OVERRATED AND CAN RUIN YOUR LIFE. N.p., 8 Dec. 2014. Web. Chi, Yei Bi. The Totem. Digital image. 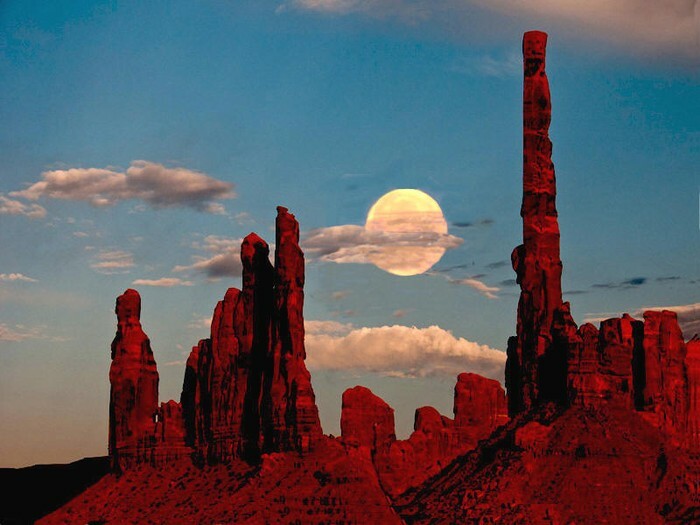 Monument Valley. N.p., 2002. Web. Crawford, P.V. Snake River Crossing. Digital image. Snake River Crossing. N.p., n.d. Web. 11 Mar. 2015. It is Day 26 of the adventure of going across the Oregon Trail. Although the days have been long, today got a little bit more exciting. We ended up meeting up with another family in our wagon group. They also had three children to my kid's delight. I was happy to see my kids running around and playing with the others. My wife and I also enjoyed the company of other adults. After spending the day with the other family , my family and I settled down and had our nightly dinner around a fire and enjoyed one another's company. As we were eating dinner, I heard a pack of coyotes howling in the distance. Hearing their beautiful but eerie chorus of howls sent chills up my spine. We were truly out in the middle of nowhere. The feeling was almost surreal. After listening to the coyotes for awhile, I got my exhausted children to fall asleep in the wagon before I started writing this entry. It has been 30 days since my last journal entry and things could definitely be better. For starters, we had to cross a river yesterday. That was a fete in itself. 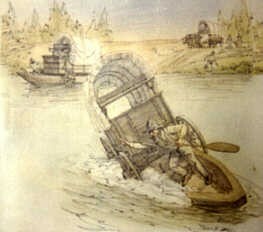 Luckily, the trail wagon leader was an expert on crossing rivers. While crossing the river, unfortunately a little bit of our food supply fell in to my horror. Luckily, other families in our trail wagon group were kind enough to offer us some of their food. My kids loved the excitement of crossing the river but my wife and I were wary of it. Also, about a week ago, a child of another family was bitten by a rattlesnake. Thank goodness it was a dry bite, meaning the snake didn't bite with any venom, but it still doesn't look too good. It was hard to get to stop bleeding and it looks a little infected. Hopefully the boy will be alright. It has been nearly a month and a half since my last entry and this will probably be my last. This journey has been anything but smooth. Supplies are running low along with the spirits of everyone in our trail wagon group. Winter is nearly approaching, and therefore the days have become to be cold along with almost unbearable nights. Everyone just wants to get to Oregon. This trail has taken a big piece out of almost everyone, except for the trail leader who always sees to be cheery. We have gone through quite a lot this past month. We got attacked by some Indians which resulted in 4 causalities and 3 injuries, including a shoulder injury I received by an arrow piercing it. Along the trail, a small boy who seemed to have lost his parents was adopted into our family. Unfortunately, three days later he died of Cholera. His death was a hard hit on our family. Luckily we should be reaching Oregon any day now.